How can we help? Find answers to your most asked Water Tank FAQ's! Q: What size tank should I buy? A: Every installation is different, the size required will vary depending on the water source, the desired application, the space available, as well as personal preference. We advise buying the largest tank that space, budget and practicality allow. For more detail on our range available, please refer to our Full Product Range. Q: Can someone install my tank for me? A: Yes – On our website under “Tank Installers” you will find a list of preferred installers who are equipped and capable to install our tanks. Kindly contact any of them in your area to recommend and quote an installation that will suit your specific requirements. You can find our list of Recommend Installers here. Q: Can we build our own tank stand/structure out of gum poles, wood etc.? A: We recommend that you make use of the JoJo tank stands as they were designed by structural engineers. We are in no position to advise on a structure of any other kind. Q: Pump vs Elevation as pressure solution? A: In order to get enough pressure by using elevation, a tank stand with a height of at least 3m is required. This will provide pressure of approximately 0.3 bar. Standard municipal pressure is 4 bar (depending on the area). We would advise the use of a pressure pump (if possible) which provides 4 to 6 bar pressure and is more cost effective. Find out more about our pump range here. Q: The installation of a septic tank and how it works. A: There is a very specific, highly-recommended installation procedure for all sanitation tanks. Detailed instructions can be viewed here. Q: What material is used to manufacture JoJo products? A: Base polyethylene with pigment anti-oxidants and UV stabilizers to ensure an extended service life. 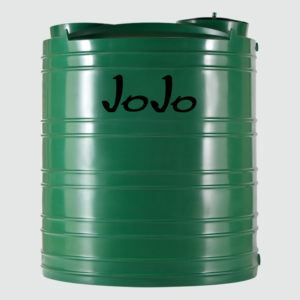 JoJo uses the best food-grade quality LLDPE (linear low-density polyethylene) for all our roto-moulded products, with the exception of septic and conservancy tanks, which are manufactured with recycled plastic in order to reduce destructive waste output. Q: What is the estimated life expectancy of a tank? A: JoJo has a 10 year guarantee (extended from 8 years as of 1 September 2017) on material and workmanship. However properly installed JoJo tanks have been known to exceed a lifespan in excess of 20 years. Q: Are JoJo tanks UV resistant? A: Yes they are and this UV resistance gives them their durability in harsh SA weather conditions. Q: Are JoJo Tanks BPA free? A: Yes – we use the best food-grade quality virgin LLDPE for our products and our tanks cannot cause any damage to water. Our tanks are UV resistant, and all our water tanks are lined with an FDA approved food grade carbon black lining to prevent algae growth and keep the water stored fresher for longer. Q: Can I drill additional holes in my JoJo Tank? A: Installation and maintenance of and JoJo tank should be in accordance with the manufacturer’s specifications. If you drill any additional holes or make any alterations to the tank whatsoever, the integrity of the tank is jeopardized, and your guarantee will fall away. Q: What colours are JoJo Tanks available in and are there additional costs involved? 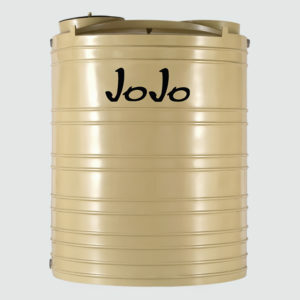 A: JoJo manufactures water tanks in various colours and this can be specified when ordering. To view our colour range, please refer to our Colour Spectrum. Q: Do you deliver to the public? A: Our main distribution is through the major reputable hardware stores and chains throughout the country as well as leading agricultural co-operatives. Prices and availability will have to be confirmed with the distributor of your choice. Lead time to delivery is 7 to 10 calendar days for stock items, and 14 calendar days for non- stock items. Find out which distributors are in your area here. Q: Where can I buy a JoJo tank? A: JoJo has factories in Pretoria, Groblersdal, East London, Uitenhage, Worcester, Bloemfontein, Glencoe and Camperdown. Our main distribution is through the major reputable hardware stores and chains throughout the country, as well as leading agricultural cooperations. Find distributors in your area here. Q: Are fittings included in the price? A: All standard fittings on tanks are included in the price. A special diesel fitting is required for all oil-based products, please ensure this is specified on your order (a diesel seal can be identified by its yellow nut). For detailed specifications on what each product is supplied with please refer to the specification sheets on each product page. Q: Are taps included and what is needed additionally to install a tap? A: A variety of 20mm taps, e.g. plastic, lockable solid brass or nickel plated can be ordered separately at additional costs and a 40/20 reducer is also needed to fit a tap to our standard water tanks. For more detail on our range of taps available, click here. Q: Are JoJo dog kennels available in the same colour range as the JoJo tanks? A: Yes, but please make your colour preference clear when ordering your kennel. View our full colour range available here. Also remember that the marble sandstone colour carries a premium of approximately 10% over the regular solid colours available. Q: Can I paint my tank? A: Yes – just be sure to paint the tank with a plastic primer (obtainable from all co-ops and leading hardware stores) first, and thereafter with a good quality paint, e.g. Micatex that would shrink and expand simultaneously with the tank in all weather conditions. Q: What does S.G. mean? A: Density of water: When considering which plastic tank to use, it is important to know that they are rated based on the “specific gravity’ (SG) of the substance they are designed to hold. In other words, tanks with a higher specific gravity rating will have thicker walls and will be designed for heavier duty use when compared to another tank made from the same material but with a lower specific gravity. JoJo tanks are specifically designed for each intended purpose and it is necessary to specify the intended use prior to making a purchase. Specific gravity (SG) is the ratio of the density* of a substance to the density of a standard, usually water for a liquid or solid, and air for a gas. *Density: mass of the same unit volume 1 lt water = equals 1 kg of weight 1000 lt water = equals 1 ton of weight 2500 lt water = equals 2,5 tons of weight. Contact us for recommendations and guidelines based on your specialised chemical-grading requirements. Q: What does (w) (m) and (h) mean and what is the difference? Q: What is the maximum pressure that JoJo tanks can handle? A: An above ground JoJo tank cannot handle any additional pressure (internal or external). That is why JoJo offers a 6000lt underground tank specifically designed to be installed below ground level. For something smaller, you can use any of our conservancy tanks varying from 1250lt to 2500lt. Although these tanks are normally used for sanitation purposes, they can also be used for rainwater or greywater harvesting, and are made strong enough to withstand the pressure from the soil when empty. Note: If any other tank is installed below ground level a retaining wall is required. Q: What is the maximum temperature that JoJo tanks can handle? A: A JoJo tank is designed to withstand the full range of temperatures that occur throughout South Africa: However, liquid stored inside the tank should not exceed 40°C. Q: Is it safe to store petrol/diesel in your tanks? A: NO PETROL can be stored in a JoJo tank. However, it is safe to store diesel in any of our chemical medium tanks (based on the material we use), although with the price of diesel in mind, we would suggest that you consider using a chemical heavy duty. Q: What is the difference between vertical and Horizontal tanks and how does one use them? A: A vertical tank is the familiar normal upright tank and is used for the storage of water, liquid fertilizers, chemicals and most other liquids. A Horizontal tank is also known as a transporter tank. It can be fitted onto the back of a LDV or a truck and can also be used to build a water-car. 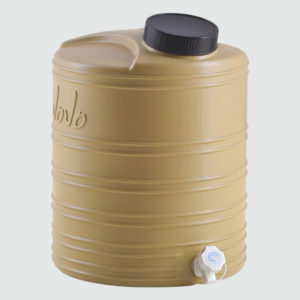 It is ideal to transport water to dry, rural areas or building sites. The chemical tanks are often used to transport and store liquid fertilizers, diesel, molasses, etc. 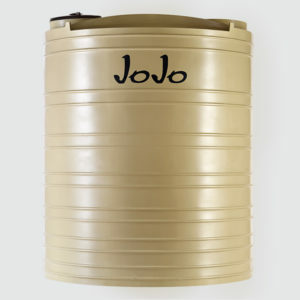 Q: What is the difference between the JoJo Slimline™ rainwater harvesting tank and the Slimline™ standard tank? A: The JoJo Slimline™ rainwater-harvesting tank includes: The tank with the standard inlet/overflow at the top and the outlet at the bottom, as well as an additional fitting for the tap. Also included in the price is a tap and a stainless steel mesh/sieve (fitted beneath the lid to assist in keeping out smaller debris). The Slimline™ standard tank includes: The tank with the standard inlet/overflow at the top and the outlet at the bottom. The tap and sieve are not included. View our entire Slimline Range available here. Q: What are your tank stands made of? A: The JoJo tanks’ stands, made of mild steel, were purposefully designed by structural engineer and are built by our technical team. The stands are painted with red oxide to prevent rust. * If you want your tank stand galvanized you are more than welcome to do so yourself, just be sure to state that on your order, in which case they will not be painted with red oxide to facilitate the galvanizing process. Q: Can the JoJo tank alert turn the pump, which keeps the tank full, on or off? Can the Tank Alert be used in a reservoir? A: NO. The wireless JoJo Tank Alert contains an electronic gauge that accurately and reliably measures the water level in your tank and transmits the information to a receiver located in your home. Communication distance to the receiver is typically greater than 200m (within line of sight) and measurement resolution is down to 1cm. It is also only able to measure the depth of the water up to 3m. The same is valid for a reservoir which typically would be deeper than 3m. Q: Do you have tanks that can be fitted on trucks? 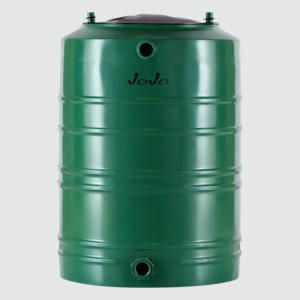 A: JoJo manufactures a wide range of Horizontal water and chemical tanks (from 240L to 5500L) suitable for use in agriculture, chemical and other industries. A Horizontal tank is also known as a transporter tank and can be fitted onto the back of an LDV or a truck to build a water-car. Q: Can the Horizontal tanks be placed directly onto level ground as a rainwater tank? A: The tank is definitely suitable for rainwater harvesting, as long as you order a water tank and not a chemical tank. Note: No tank may be placed on bare ground, since it is not stable and the tank will be damaged by the uneven surface. All tanks must be placed on a solid foundation (a smooth and level concrete slab is ideal) of no less than 85mm thick. It is very important that the surface is level and smooth to ensure a robust base for the tank. Q: What is the difference between a septic/conservancy tank? A: A septic tank: designed for the disposal of sewerage only, and brings about the digestion of organic matter and discharges the black water into a French drain to soak away into the ground over time. Conservancy tank: disposes of both black and grey water, and are used for temporary storage until the waste is pumped out by honey-suckers. 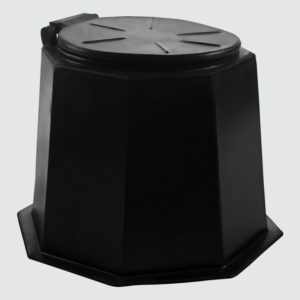 Often referred to as ‘heavy-duty’ septic tanks, their structural design is extra strong and sturdy enough to withstand the pressure from the soil when empty. It is important that the correct tank is used for the correct application in order to avoid damage to the tank and to ensure the system functions properly.The correct tank will be determined by the type of waste, as well as the desired application and disposal method. For more information click here. Q: Which size septic tank should I buy? Q: Can water from basin and bath go through the septic tank? A: No, soapy water or chemicals cannot be used as this will kill the bacteria and stop the normal functioning of the tank. “Septic Friendly" chemicals can be obtained from most co-ops or stores that specialise in outdoor products. Q: How to enable the digestion process of a septic tank? A: The digestion process can be enabled by using a starter pack (available at most outdoor stores or co-ops, or by simply putting a piece of rotten meat inside the tank). Q: Can I link/connect septic tanks? A: If you want to use the tanks for water storage, it will be possible to connect two or more tanks. However, if used as septic/conservancy tanks, we strongly advise against it as the purpose of the septic tank is to separate solids from liquid. Even if the tanks are being used as conservancy tanks that can be pumped out, the tanks should not be joined and pumped out from one place only. If liquids are pumped out from one outlet, pipes will quickly become blocked, creating a huge problem. 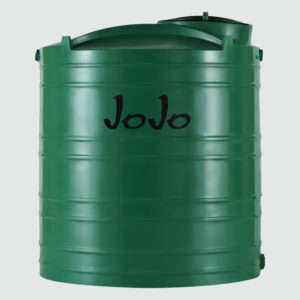 Q: Is water stored in a JoJo water tank safe to drink? A: All JoJo water tanks are lined with an FDA approved food grade carbon black liner that prevents algae growth and ensures your water will stay fresher for longer. A JoJo tank does not cause any damage to the water; the quality of the incoming water however may well be an issue. Please remember that water collected from the roof of a building will not be clean. If in emergencies you need to drink the water from the tank, it must be purified. The best way to purify small amounts of water is to bring it to a rolling boil for a minimum of one minute, thereafter it will be fit for human consumption. For irrigation purposes, however, the water would be perfect. Q: How to keep the water inside my JoJo fresh? A: What tends to happen with long term storage is that water goes “flat”. To prevent that you can aerate your water. This is achieved by pouring water form one container to another a few times, at a slight height to re-introduce the air. You could also draw up a tank roster to rotate/circulate the water a set intervals by using that water for a few days to reduce the water level in your tank. Thereafter, you can refill with fresh municipal water (you could wash your car, fill up the pool, water the garden etc.). Q: How long can municipal water be stored in my JoJo tank? A: In ideal circumstances municipal water can be stored inside a JoJo tank for a long time, as municipal water is chlorinated and safe to store for extended periods. Just be sure that the tank is properly sealed and that it is a water tank (with the food-grade black inner lining). It is recommended that the water is run once every two weeks to rotate the water and ensure that the best quality water is available. Q: DIY vs Professional Installer (cost vs benefit), what is better? A: This depends on the scale of the project, small projects are perfect for the DIY guy, but larger projects are too risky to get wrong, get a pro. Q: What size tank should I use? A: Every installation is different. We would suggest you buy the biggest tank that space, budget and practicality allow (see Rainwater Harvesting Solutions for more detail). The biggest downfall of rainwater harvesting systems is lack of storage capacity. Q: Do I need a base for the tank? A: Tanks must be installed on a sound, level and smooth surface. Level paving will suffice, or a properly designed tank stand. Alternatively a concrete plinth needs to be built, ideally with a concrete surface bed at least 85mm thick. Q: Do I need to change my gutters or make alterations to my roof? A: With careful planning and execution, existing gutters require very few changes or alterations. Q: What pre-filtration/accessories do I need? A: Basic rainwater harvesting installations only incorporate a mesh at the top of the tank (underneath the lid) to keep out dust, leaves, mosquitoes etc. Additionally you can incorporate a rain head/leaf eater (removes larger debris) and a first flush diverter (takes off initial dirty water for every rainfall, improving the quality of water). The more pre-filtration devices installed, the better the quality of the water. For more detail on our range available, click here. Q: Does the tank have an impact on the quality of the water? A: All JoJo tanks are lined with an FDA approved food grade carbon black liner that prevents algae growth and ensures water stays fresher for longer. A JoJo tank does not cause any damage to the water, the quality of the incoming water however may very well be an issue. Please remember that water collected from the roof of a building will not be clean. Should you need to drink the water in an emergency, it must be purified or boiled before it will be fit for human consumption. For irrigation purposes however, the water would be perfect. Q: Would it work with any type roof? A: Thatch is about the only roof surface not suitable for rainwater harvesting, the others just vary in efficiency. Pitched or flat makes no difference. A: A well designed system needs little maintenance but never more than a pool would, for maintenance tips click here. Q: What size tank is ideal for municipal back up? Q: How does the pump sense when municipal back up has failed? A: The pressure controller (built in) senses a drop in pressure and starts the pump operation, i.e. pumping water from the tank into house. Q: How long can municipal water be stored in a JoJo tank? A: In ideal circumstances municipal water can be stored inside a JoJo tank for a long time, because it is chlorinated and safe to store for extended periods. Just be sure that the tank is properly sealed and that it is a water tank (with the food-grade black inner lining). It is recommended that the water is run once every two weeks to rotate the water and to ensure that the best quality water is available. Q: How do I keep my tank clean? A: Depending on the size of the tank, when empty (and if it is not mounted on a tank stand etc), you can simply turn the tank on its side (on grass) and then using a broom/mop and some sunlight dishwasher you can easily clean it. Just make sure to hose out all of the soap when done. Q: My tank is damaged, how do I get it repaired? A: It can be repaired by using a hot air gun to weld a piece of the same plastic as the tank over the split/crack on the inside and outside of the tank. Our recommended installers can also assist with them, find an installer in your area here. Q: What is the use of the 6000L underground tank? A: The 6000L underground tank has many uses: it can be used to store greywater and rainwater, it can also be used as a conservancy tank that can be pumped out and/or septic tank. It is the answer when space and accessibility are an issue – especially in an urban environment. Q: Can I use my underground tank to harvest rainwater? A: Yes - If the tank is used for storage of rainwater from the roof, the water can be filtered through a first flush diverter before entering the tank. See installation instructions for an underground tank here. Please also see installation instructions for rainwater harvesting here. Q: Can I clean my underground tank? A: It is possible to clean an underground tank, by literally climbing into it and scrubbing with a brush and any liquid dishwashing soap, etc. The opening of the tank at the top is 410mm, which is wide enough for a person with a slight build to climb through.